On Tuesday 29 January Blackburn with Darwen Borough Council and the Blackburn with Darwen Interfaith Forum will jointly host the annual ceremony in the Council Chamber at Blackburn Town Hall. 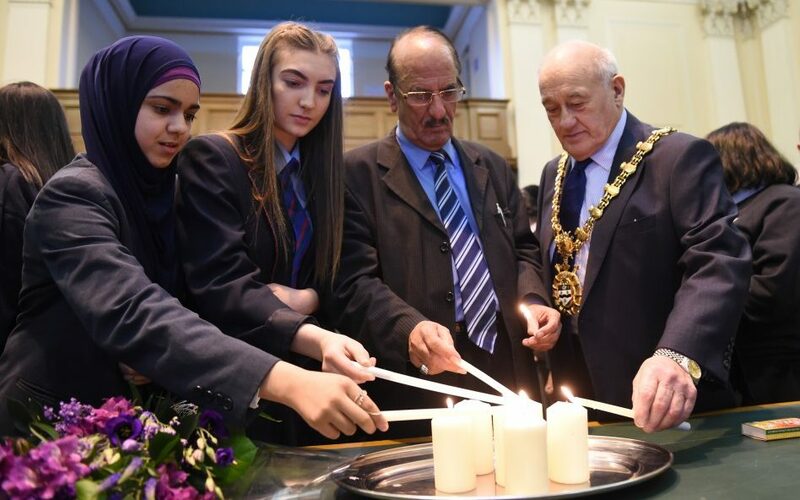 With speakers from different faith communities and contributions from local secondary school pupils, the ceremony aims to share the message that hatred in all forms will not be tolerated while reflecting on poignant stories from the Holocaust and more recent genocides. The theme of this year’s Holocaust Memorial Day is ‘Torn From Home’. It encourages us to consider the impact of people suddenly being driven out or wrenched from their homes because of persecution or the threat of genocide. Groups of pupils from eight local schools are preparing short presentations on the stories of individuals who found themselves torn from their own homes during the Second World War. Representatives of the local refugee community will speak about their own experiences, giving a current and personal account of fleeing persecution. Blackburn with Darwen Youth MP Ellie Walsh will give a short statement and a video from the Holocaust Memorial Trust will also be shown. Rabbi Arnold Saunders will give the keynote address. The end of the ceremony will be marked with the lighting of candles as a sign of peace, unity and hope for the future. As a local authority we have committed to reject hatred in all its forms. This annual commemoration of the holocaust reminds us why it is so important to listen to the lessons of the past so that we can all play a part in creating a safer, more tolerant future for everyone. This year’s theme, with its focus on the importance of a safe place to call home, is something we can all relate to. I am pleased that pupils from eight local schools are taking a role in the ceremony to highlight the pain and suffering experienced by children in Nazi Germany who were separated from their families. The understanding they will gain from studying these harrowing accounts will help them to appreciate how we cannot allow such atrocities to ever happen again. Our local interfaith community comes together annually for Holocaust Memorial Day in what is always a very moving ceremony. This year I’m pleased that we will also be hearing from members of our local refugee community, whose personal accounts of having to leave homes in their native countries will help us all to gain a deeper understanding of the impacts of oppression and persecution. This is an important event in our annual calendar. Anyone in Blackburn with Darwen is welcome to join us to remember the victims of the holocaust and other genocides. The Holocaust Memorial Day ceremony will be held between 1.30pm and 2.30pm on Tuesday 29th January in Blackburn Town Hall. Anyone who would like to attend should contact the Council’s Governance and Democratic Manager Phil Llewellyn on (01254) 585369 or phil.llewellyn@blackburn.gov.uk.